Purex, Honey Bunches of Oats, and Outrigger Hotels and Resorts are joining forces to send one lucky winner on a tropical paradise vacation to Outrigger Waikiki on the Beach! Five (5) 1st place winners will receive one-year's supply of Purex Tropical Splash Detergent & Honey Bunches of Oats Tropical Blends Cereal. 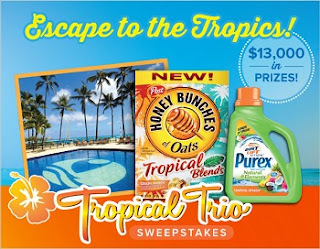 One hundred (100) 2nd place winners will receive coupons for FREE Purex Tropical Splash Detergent & Honey Bunches of Oats Tropical Blends Cereal.